Up until I became a mother, I was not one for house cleaning and was not even much of a tidy-upper, either. Having kids of my own was the tipping point at which my inner-mother evolved. I grew up in a traditional middle-class household. Dad went out to work and Mom was the ‘home engineer’. She was the perfect role model in terms of eating well; she ate well balanced meals and enjoyed desert from time to time, (she definitely had a sweet tooth, which she did not deny). I only learned about dieting from my peers whose mothers were experimenting with fad diets. Mom never needed to diet even though she was never a formal exerciser, she just never stopped moving. And out of the blue, we’d often find her in a headstand. She’d have her shower, then wipe down the shower to slow down the mildew from taking hold, which in the long run would make her house maintenance more manageable. She wouldn’t take a flight of stairs without taking something up or down along the way. She always seemed to be putting a load of laundry in or folding a basket-full. It drove me crazy! As a tween I couldn’t stand to see her always working. I vowed I wouldn’t be like her when I grew up…I would only do things that pleased me. Almost thirty years of running from reality, it’s now official…I have become my mother, AND surprisingly, it pleases me! Just before spring of this year our present day cleaning lady retired. At the same time, I was starting up this site and decided that I would now tackle our house cleaning on my own. My reasoning was that if I had time to start up a website then I had time to do all the house maintenance as well. I made a deal with myself that I had to get a certain amount of cleaning done each day before spending any time working on my site. It was not so easy to clean the house the way I wanted it clean with infants, toddlers or pre-schoolers, but now that the kids are in school full time I know I can take this on. I’m not very good at it yet and it can be overwhelming at times, but if I tackle a job a day and keep the cycle going it seems to work well, at least in my opinion. From Tom’s article, “NEAT includes all the calories you burn from casual walking, shopping, yard work, housework, standing, pacing and even little things like talking, chewing, changing posture, maintaining posture and fidgeting. Walking contributes to the majority of NEAT. One of the major pitfalls that happens to people who take on extreme workouts is that they wear themselves down so much that they have no juice left for NEAT. And then they over consume calories, which negates the calories burned in the first place! This is why I am such an advocate for incorporating 4 Minute Mornings and Short-Duration-High-Intensity Training into your life, specifically for those who don’t have time for longer body maintenance workouts. It doesn’t mean I don’t believe in going for a jog/ run or long walk etc., but what I think happens to so many people is that they put so much belief into those long workouts to help them lose weight that they end up dismissing the significance of NEAT. And the cycle continues. It’s all about balance. And that is what we mean when we talk about balance. Exercise to become strong to live an active life. But then there are those who DO a high level of NEAT all day long, those with physically demanding jobs. All I can say is that it’s in the numbers: calories in vs. calories out. How you fuel yourself is the most important factor to consider. Eat real food, experiment with what energizes your body, don’t diet. but DON’T overtrain or you’ll burn the candle at both ends, wasting your time and not getting results. Read Tom Venuto’s article, it will help. Photo: My Mom, Lea (1934-2004)- named after my Great Aunt Lea. 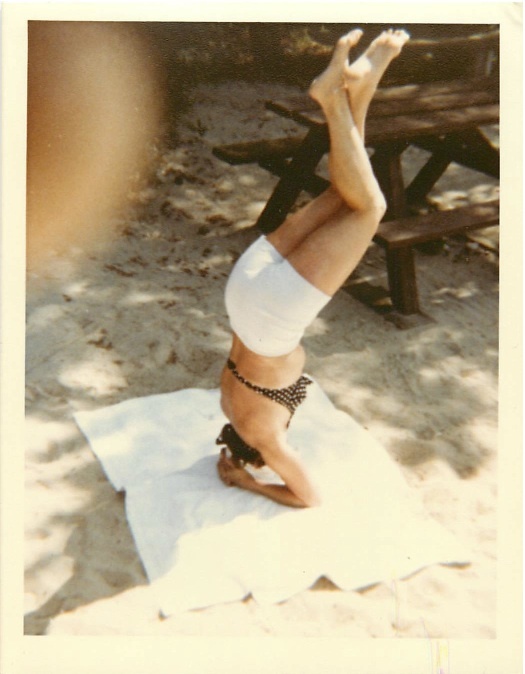 Doing a headstand at the cottage, age 48. Such a great post and love the photo of MOM – I look forward to checking back periodically.